Bose-Einstein condensates (BECs) are macroscopic systems that have quantum behaviour, and are useful for exploring fundamental physics. Now researchers at the Gakushuin University and the University of Electro-Communications have studied how the miscibility of multicomponent BECs affects their behaviour, with surprising results. Fundamental particles have a property associated with angular momentum described as spin. Force particles - photons, gluons, and so on - have integer spin values and are called bosons; matter particles - electrons, neutrons, protons, and so on - have half integer values of spin and are called fermions. In composites of several fermions, as in atoms and nuclei, the total spin can be integer values so they can behave as bosons. While identical fermions cannot occupy the same state, bosons can, and if cooled to sufficiently low temperatures they will all occupy the lowest possible energy state - a Bose-Einstein condensate. The researchers studied a BEC of rubidium atoms exploiting the element's rich spin states. They created optical traps containing around 3 x 105 atoms in two different spin states, and applied magnetic-field gradient pulses to separate condensates with different spins. 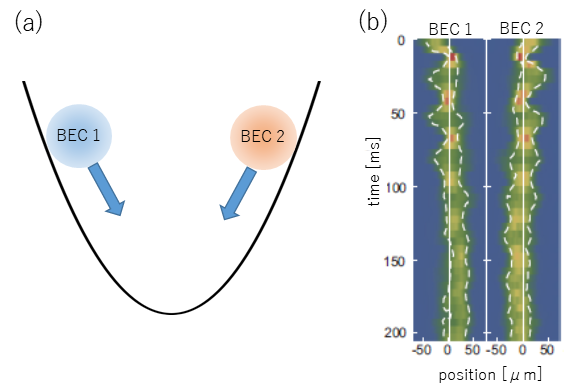 The miscibility of different components of a BEC is determined by the strength of interactions between and within the atoms, which the researchers could tune to produce miscible and immiscible multicomponent BECs. After removing the magnetic field they left the system to evolve before releasing from the trap and imaged the resulting condensate distribution. "The various counterintuitive effects such as mutual penetration in immiscible BECs, bouncing between miscible BECs, and domain formation in miscible BECs were observed," report the researchers. Numerical simulations of the system revealed further insights, showing that "the properties of penetration and bouncing can be tuned by slightly changing the atomic interaction strengths."